“Amarynthos” is associated by several Greek and Roman sources to an important Sanctuary of Artemis located nearby Eretria, on the island of Euboea. Some of the city’s most important decrees engraved on stone were exhibited at the sanctuary where the state treasury was also kept. The most prestigious festival of the Eretrians, the Artemisia, took place there and was attended by citizens from the four poleis of Euboea, and beyond. Yet, despite its regional fame and prominence, its remains have eluded archaeological identification. 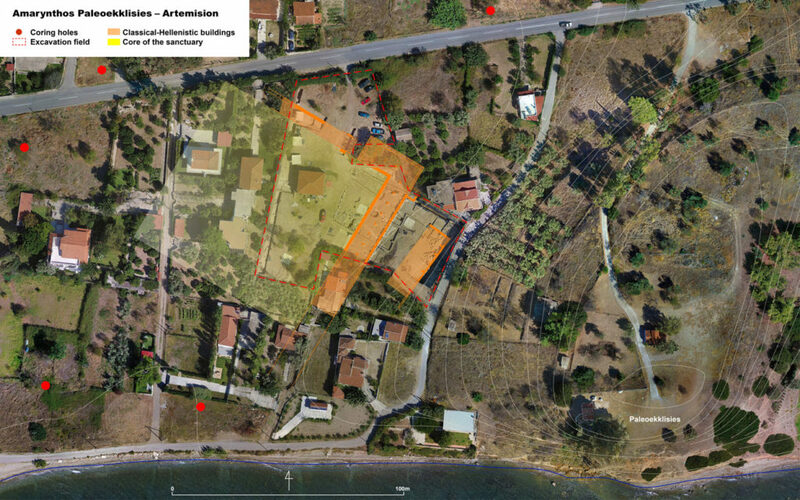 As a result, the location of the Artemision has been a vexed question in Euboean topography for over a century, until recent excavations by the Swiss School in collaboration with the Ephorate of Antiquities of Euboea put the location of the Artemision near the hill of Paleoekklisies, some 11 km east of Eretria, beyond doubt. Until the 19th century, amongst the European travellers and Greek archaeologists, very few doubted that the sanctuary of Artemis Amarysia was at close distance to Eretria, following Strabo’s testimony that the small town (kome) of Amarynthos was located 7 stadia (ca. 1,250 m) away from the city walls (teichos). However, excavation by the American School of Classical Studies in 1900 failed to locate the sanctuary, whereas fortuitous discoveries – chiefly inscriptions – made in the region of Kato Vathia suggested that the Artemision might be located further to the east, in the area of the Paleoekklisies Hill. The debate about the position of Amarynthos continued during most of the 20th century. 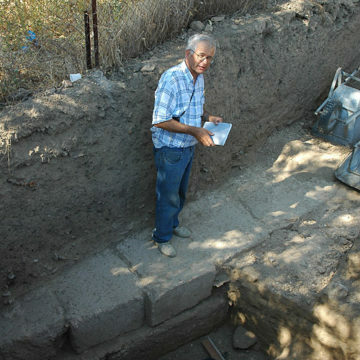 Eminent archaeologists, like John Boardman, followed the traditional localisation and focused on remains located in the suburban area of Eretria. In the early 1970s, Denis Knoepfler carried out a systematic study of the available evidence andreached the conclusion that the distance given by Strabo was incorrect. According to him, at some point in the transmission of Strabo’s text, the written numbers were replaced by numbers spelled in alphabetical notation. In the latter system, the number 7 (ἑπτά) is transcribed by the letter ζ (zeta), whose mark is almost identical to the letter ξ (xi), which equals 60 (ἑξήκοντα). A Byzantine copyist could have easily mistaken a ζ for a ξ. Therefore, it can be reasonably assumed that the original text of the Geography reported the distance as sixty stadia (and not seven) between Eretria and Amarynthos. This number (approximately 10.8 km) perfectly fits the length of a direct path between Eretria’s East Gate and the western foot of the Paleoekklisies Hill. This hypothesis needed to be validated by the discovery of remains that could be securely identified with the sanctuary. This required a further 20 years’ investigations. Although the general location of the sanctuary could now be more confidently reconstructed, no architectural remains were visible, even though much modern building had taken place since the 1960s in this area. 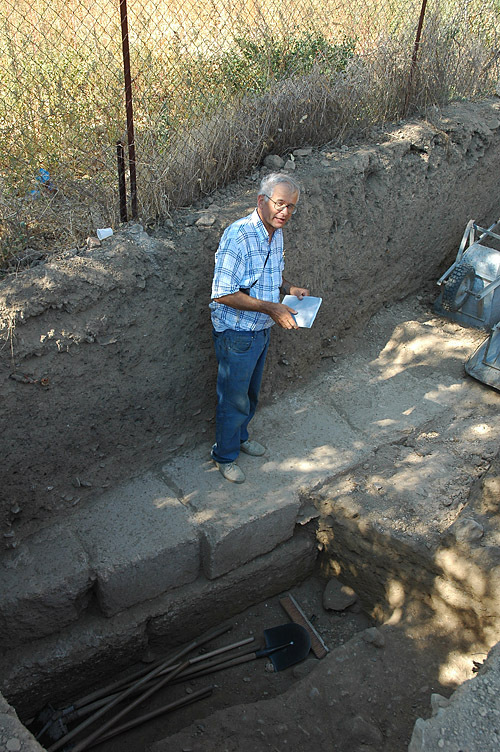 The discovery of a deposit with votive finds by the Greek Archaeological Service in 1987 at some distance from the sea brought much controversy: no archaeological structures were found in relation with the deposit, which might have been a cache used by illegal diggers. In the early 2000s, the Swiss School planned to explore the region near Paleoekklisies Hill. In 2003 and 2004, a large-scale geophysical survey was carried out, which was followed by trial trenches in 2006 and 2007. 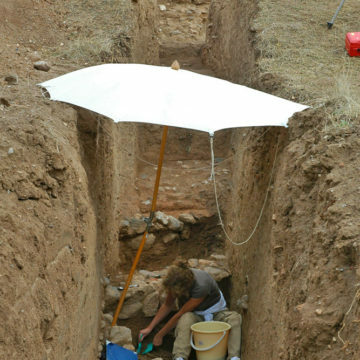 The first excavation season was not conclusive, although a Helladic settlement was uncovered north of the tell. The 2007 campaign proved to be a turning point, with the discovery at the western foot of the hill of massive foundations belonging to a monumental building buried 2.10m below the surface. 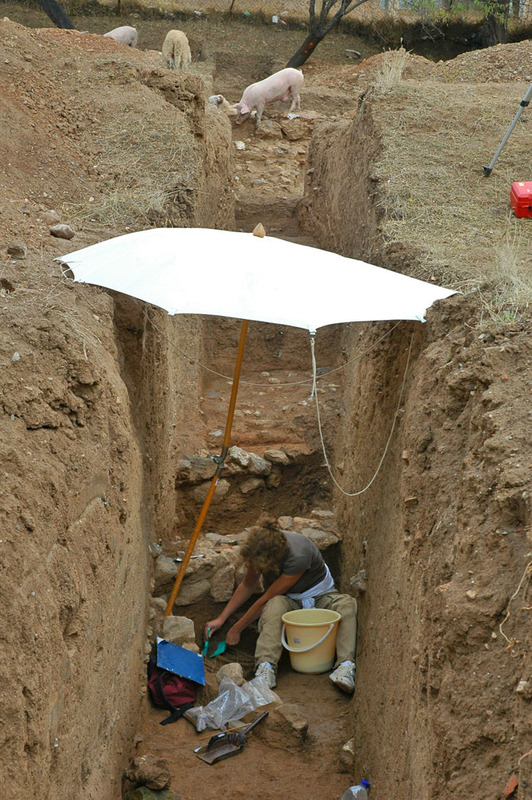 In the following decade, the Swiss School aquired several plots in order to extend the area of excavation in collaboration with the Ephorate of Antiquities of Euboea. 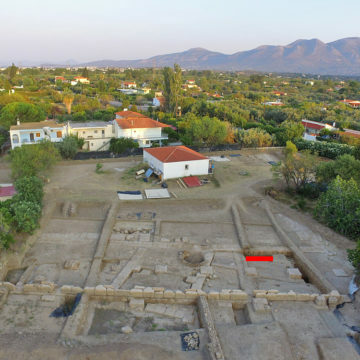 Several ancient buildings, including a large stoa, were unearthed, suggesting the existence of a large public complex, in all probability the sanctuary of Artemis Amarysia. In 2017, conclusive evidence was obtained for the identification of the Artemision, with the discovery of a series of terracotta tiles stamped with the name of the goddess Artemis, as well as of several stone inscriptions bearing the name of the triad, Artemis together with her brother and mother, Apollo and Leto. View of the stoa (2017). In red the 2007 trench. 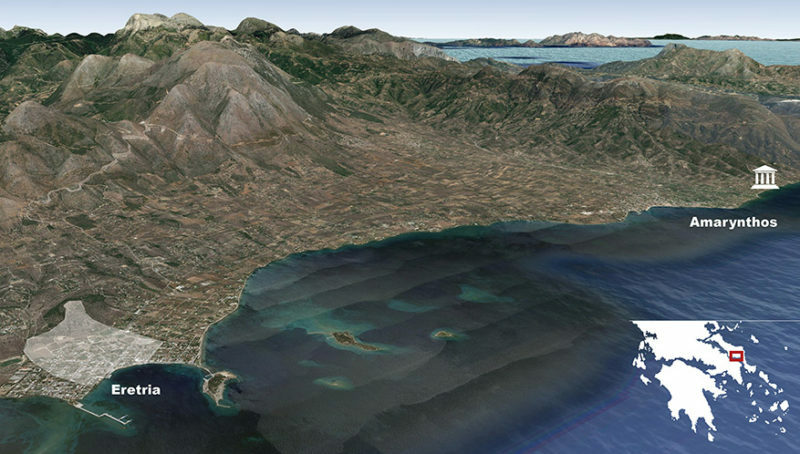 Knoepfler Denis, Sur les traces de l’Artémision d’Amarynthos près d’Érétrie. CRAI 1988, 382–421. Ghilardi Matthieu et al., Reconstructing mid-to-recent Holocene paleoenvironments in the vicinity of ancient Amarynthos (Euboea, Greece). Geodinamica Acta 25.1-2, 2012, 38-51. 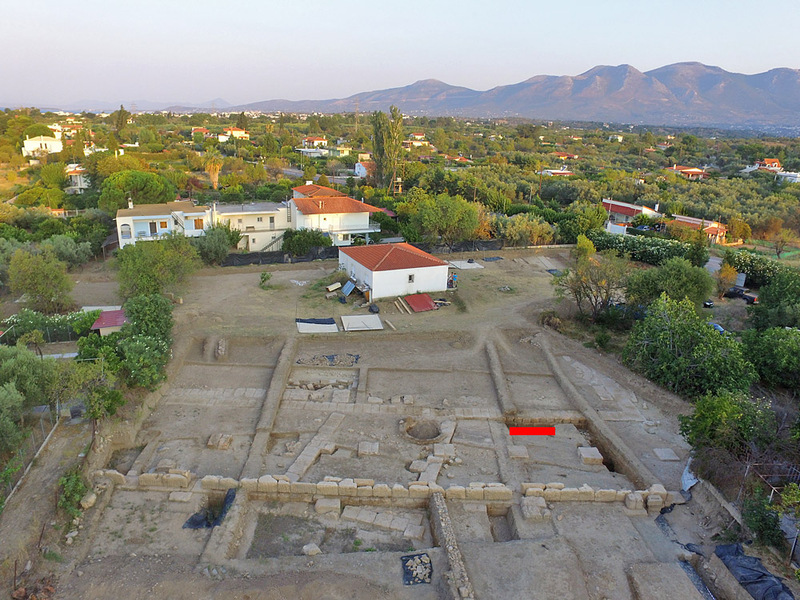 Fachard Sylvian et al., Recent Research at the Sanctuary of Artemis Amarysia in Amarynthos (Euboea). Archaeological Reports, JHS 2017, 167–180. Reber Karl et al., Auf der Suche nach Artemis. Die Entdeckung des Heiligtums der Artemis Amarysia. Antike Welt 4, 2018, 52–58.